Chess, despite being one of the world's oldest, is a wonderful and exciting game that can provide endless opportunities for enjoyment and excitement. Chess is played by people of all ages and its educational value is widely recognised. The game knows no social, ethnic or political boundaries - the people who participate just need to enjoy pitting their wits against one another and of course having a friendly chat afterwards. Another good thing about chess is that it must be one of the least expensive games to participate in! It is essential to join a chess club in order to enjoy chess to the full, although chess can be enjoyed in many other ways as well including solving chess problems, playing against chess programs and playing people from all over the world via the Internet. The club plays at The Navigation Inn, 9 Stockport Road, Marple, Stockport, SK6 6BD. The club meets every Thursday evening throughout the year. We start at 7:30 and finish at 11:00 but that doesn抰 mean that you have to be there for the whole time. You can arrive later and go earlier if you like, but chess does take time so allow enough for a few games. 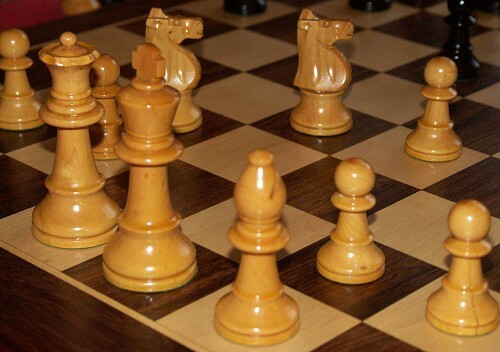 Many players like to use chess clocks in their friendly games to make sure the games don't go on for too long. The club is extremely friendly and has players of all strengths from beginner to expert, including several who have earned master titles. The club has just enjoyed another very successful season. New players who come along to the club are made to feel very welcome. We give advice and tuition to new starters and rusty players, though the most important way to improve is to play against a variety of opponents. We are particularly keen to recruit young people as we are convinced of the educational benefits that can be derived from chess. We run various club competitions and all are encouraged to participate. These have included knock-out tournaments lasting over several months and single evening events of blitz (i.e. rapid) chess and handicap tournaments where a weaker player has far more time to think than his/her stronger opponent. The blitz events have been very popular as well as exhausting! Next season the club will enter several teams in the Stockport Chess League, one of which is restricted to give those at the early learning or lower ability level the chance to experience the thrill of competitive chess. The Club will also enter teams in the First and Third Divisions of the Manchester League, giving opportunities for our very strongest players to be tested to the full. Although chess is traditionally played mainly from September to May, we keep things going right through the summer by entering two teams in the South East Lancashire Summer League and continuing to run various club events. The cost of club membership is � per year and in order to play in league events, members must also join the English Chess Federation. ECF Bronze membership costs � per year for adults and �for juniors under the age of 18.